I have homeschooled since 1998 and used many things along the way but there was always something lacking. I’ve contemplated using the Bible as a central part to my planning for the kids school year but never knew how that would look or even work. Thank you Karen for listening to the prodding of the Holy Spirit in creating this course to share with others. I’m sure there are many of us out there looking for something like this to help us step out in Faith and trust that it’ll be a good change for our homeschooling kids for a season. Wonderful course with lots of information. Training Up the Next Generation in Truth! Building a firm foundation in your family, with the Bible at the center. There is nothing that will equip your children more for life than to know God's Word and to walk in the Truth. 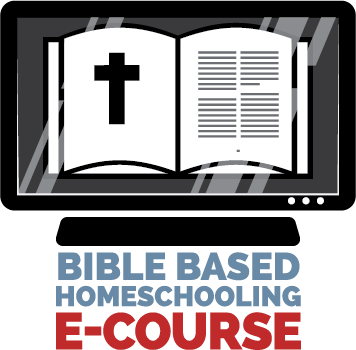 This course will walk you through how we used the Bible as our main textbook in our homeschool for an entire year. It was the MOST amazing year ever. Yet, even if you don't want to solely teach from the Bible, it is still imperative to teach with the Bible as the center of your family and your homeschool. Join me as we discover the most amazing resource we have as families- the Bible. This course includes unlimited access to over 85 minutes worth of videos detailing how we used the Bible for each subject to teach our children for one year, printable downloads to help you keep track of your resources and records, sample weeks, and extra resources PLUS free membership to a private member-only Facebook group to continue the encouragement and connect with others! I will also continue to share resources and videos to answer questions and be available to you as you walk this journey! This is NOT a curriculum, but a guide to walk you through how we did it, and no matter what you choose...to always keep the BIBLE at the center of your family! Karen DeBeus is a homeschooling mom learning to live more simply and keep God at the center of it all. She is the author of three best-selling homeschooling books and writes at Simply Living for Him. She speaks nationally at homeschooling conventions and recently was a speaker at the Bible Family Conference in Washington, DC. Her passion is to help others clear the clutter from their lives, seek God first, and to encourage women and families to get in the Word every day. In 2016, she founded the Simply Living for Him Retreat, which is a time of rest and renewal for all women seeking Jesus.